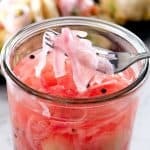 Try making jars of pickled red onions for gifts and keep a jar in your fridge to use in salads, with tacos, on sandwiches and hot dogs….etc. Heat the vinegar just to boiling, or in the microwave for 1 min. Add salt and sugar, stir to dissolve. Place red onions and other spices in the jar. Add hot mixture to the jar, cover and leave to cool to room temperature. Once cool, cover tightly and refrigerate for up to 2 weeks.